thanks for turning me onto Maruo and this amazing artform. 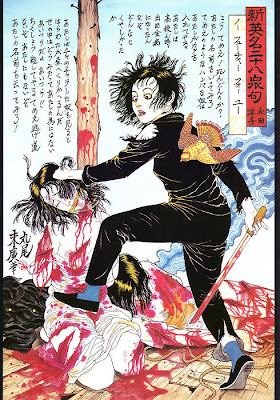 I dl'd the book "Bloody Ukiyo-e in 1866 & 1988" and I'm loving reading through it and obsessively studying the images. Beautiful and disturbing. You are more than welcome. I first encountered Maruo through paintings he did for album covers by the bands BALZAC and THE STALIN. One you see his work.... there is no going back. You will become his prisoner. Maruo one of the true artists in the oversaturated, commercial world of Japanese manga. He stands head and shoulders above the rest.